Seoul is an undoubtedly modern city, but traces of its ancient past are everywhere. Some of the best examples are its traditional gates and the remains of an 18-kilometer fortress wall. Built in the 14th century by 200,000 laborers, the wall snakes its way along the ridge lines of four small mountains. Over the years, sections of the wall were strengthened, heightened or torn down. 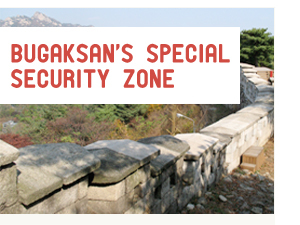 Recently, a long stretch of wall on Bugaksan Mountain were restored and re-opened to the public. 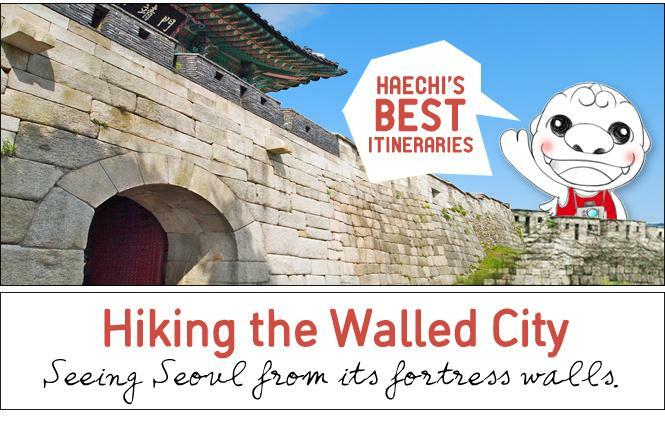 Today, hiking Seoul’s fortress walls is one of the best ways to experience the city’s ancient history, its natural beauty and enjoy some amazing views! How about we take a hike along the city’s fortress walls? Our full-day course starts at Anguk Station. 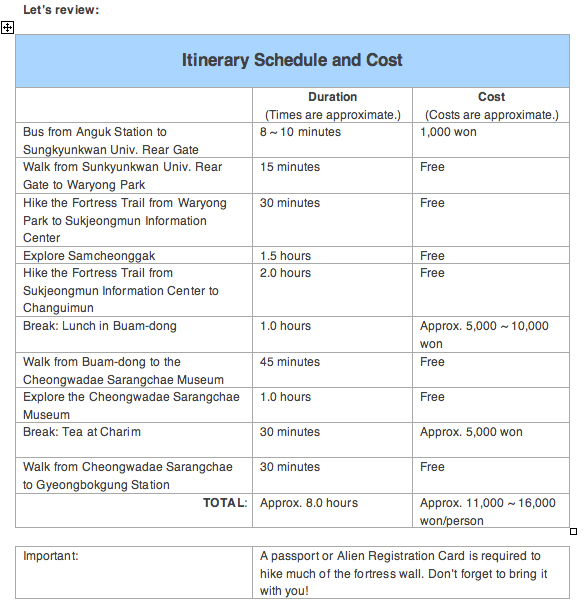 From there we’ll take a bus to Bugaksan Mountain's trailhead. Along the way we’ll visit Seoul Hanyang Doseong's (Fortress Wall) great northern gate (Sukjeongmun) and its oldest extant gate (Changuimun). 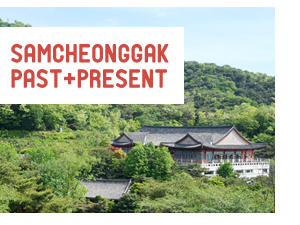 We’ll also make a pit stop at Samcheonggak, a traditional retreat once reserved for high-ranking officials. After climbing our way to Bugaksan’s summit, I bet you’ll be hungry, so we’ll head down the mountain to the charming hamlet of Buam-dong for some of Seoul’s best comfort food. 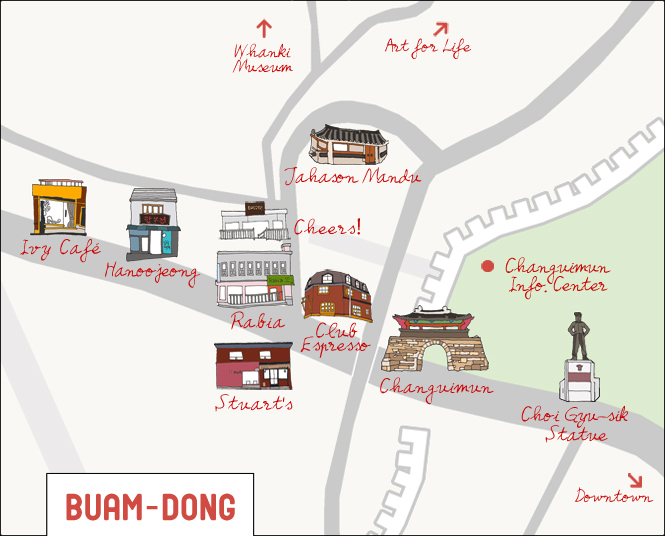 After lunch, let’s take a leisurely walk to a new museum and along Gyeongbokgung’s Palace western wall. Whew! It’s an ambitious course, so... Let’s Get Started! - At Seoul Metro Line 3’s Anguk Station, take exit #2. About five meters outside the exit is a large, bright green bus sign. - Take green bus #02 to Sungkyunkwan University’s rear gate. The fare is 1,000 won and the ride is about 8~10 minutes. Depart the bus at Sungkyunkwan University’s rear gate. - From there, follow the boardwalk up the hill. After about 100 meters, the road winds to the left. A viewing platform is on the right. Keep walking. - At the fork in the road, veer right past the tunnel and the large white letters that say “Waryong Park” in Korean. As the bus winds up Bugaksan (Mt. ), the urban jungle quickly gives way to nature. Shortly after departing the bus, take a moment to enjoy great views of the city on the viewing platform. To the right is Namsan Mountain and Namsan Seoul Tower. Directly ahead is Dongdaemun Market’s Doosan Tower. Both are great places to visit! For now, let’s walk about 100 meters up the road to catch our first glimpse of Seoul Fortress at Waryong Park. Just past the exercise equipment and badminton courts is a break in the wall. Pass through it, turn left at the trail map and walk past the blue building. A few hundred meters later, veer left at the first fork in the path. As you walk along the ivy-covered fortress walls, enjoy the tunnel of color created by the lush, flowering bushes and trees! At the next fork in the path, veer left up the stairs. Take another left at the four-way intersection toward Sukjeongmun. This part of the hike is especially beautiful. Through the trees to your right you can see the ritzy Seongbuk-dong neighborhood and a large, traditional-looking building. That’s Samcheonggak. We’ll go there in a moment, but first, let’s continue down the stairs toward the Sukjeongmun Information Center for a quick pit stop. Did you notice the various sizes and shapes of the wall’s stones? The original fortress walls were built in the 14th century and constructed of medium-sized round stones held together by earth. Some 118,000 men were organized during the agricultural off-season to start construction of the wall over 49 days. Six months later, another 79,000 workers toiled another 49 days to complete the fortress. Twenty-seven years later, King Sejong the Great improved the wall by replacing it with rectangular stones that fit closely together. This time, the effort required over 320,000 laborers and engineers drawn from across the nation. The feat was made all the more remarkable since Seoul’s population at the time was just 100,000. Another major restoration in 1704 by King Sukjong used large, uniform stone slabs. In the modern era, parts of the wall and several of its gates have been demolished. Today, about 10.5 kilometers of the original 18.2 remain, mostly in mountainous areas. 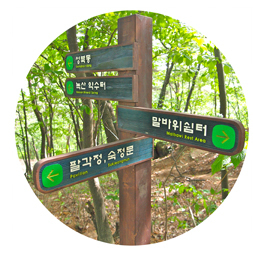 - Upon reaching the Sukjeongmun Information Center, turn right toward the Samcheong Tunnel. - Walk past the green trail map and walk over the footbridge. - Follow the trail to the main road. Turn left and walk about 35 meters until you reach Samcheonggak’s front gate. cultural performances, workshops or seminars. It’s just a 15-minute walk from the Sukjeongmun Information Center to Samcheonggak, and it’s a trip well worth the effort. The stately Samcheonggak was built in 1972 to entertain high-ranking officials. Strangely enough, few people these days know about this gorgeous destination! Samcheonggak’s name refers to clean mountains, water and good-natured people. Its immaculate grounds were operated as a private restaurant for two decades until the City of Seoul purchased it in 2000. Today, the Korean restaurant, teahouse, performance hall and guest quarters are a popular urban getaway to enjoy traditional architecture, cuisine and music. As you take a look around, you’ll probably notice there are six buildings. Ilhwadang Hall is the grandest (and the only structure built with concrete), and it’s where the restaurant and tea house are located. Three smaller halls, the Dongbaekheon Chamber, and the Yuhajeong Pavilion are also set amongst landscaped grounds and an extensive network of gorgeous traditional stone, wood and tile walls. Come back soon for a romantic dinner date! After a leisurely stroll around Samcheonggak, let’s head back to the Information Center. Once there, we must register with our passports or Alien Registration Cards at the Information Center. After just a couple of minutes, we’ll receive a neck pass and off we go! young soldiers (in park uniforms) patrol the area. October and 10:00~17:00 from Nov. to March. It’s about a five-minute hike to Seoul Fortress’ great north gate, Sukjeongmun. You may have already seen one of Seoul’s other major gates – the great east gate best known as Dongdaemun. If so, you’ll notice that the north gate is a lot smaller. In fact, Sukjeongmun’s colorful wood ramparts weren’t even built until 1976. That’s because it was built to satisfy feng shui principles more than accommodate traffic. While you’re on the gate, enjoy the view because soon you’ll be breathing heavily. Your reward for the climb? Spectacular views of the city! And before you know it, we’ll reach Baegakmaru, the name of Bugaksan’s 342-meter peak. At this point, Namsan Seoul Tower is to the left and Gwanghwamun Square and Gyeongbokgung Palace are right below us! The trip back down is pretty steep, but along the way you can enjoy the view of Bukhansan’s (Mt.) dorsal fin-shaped peak. The mountain marks Seoul’s northern boundary. Before you know it, we’ll pass the Dolgorae Rest Area and just a few hundred meters later, we’ll enter the peaceful hamlet of Buam-dong. 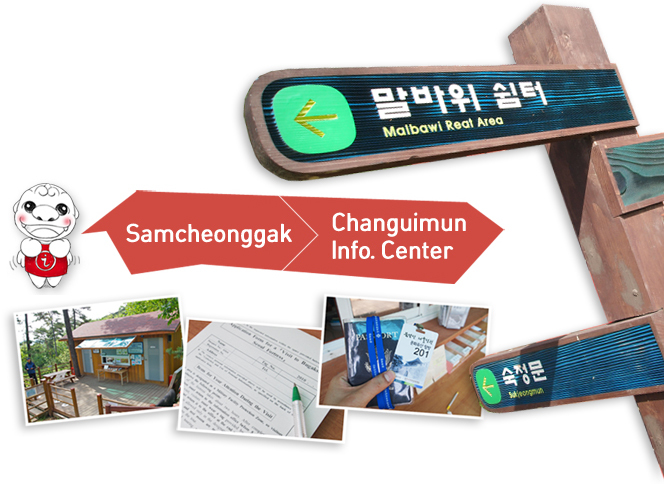 Before exiting the Changuimun Information Center, don’t forget to drop your neck pass into the basket! Back on the trail, it’s about a five-minute hike to Seoul Fortress’ great north gate, Sukjeongmun. You may have already seen one of Seoul’s other major gates – the great east gate best known as Dongdaemun. If so, you’ll notice that the north gate is a lot smaller. In fact, Sukjeongmun’s colorful wood ramparts weren’t even built until 1976. That’s because it was built to satisfy feng shui principles more than accommodate traffic. Before we head for lunch in Buam-dong, let’s take a few minutes to view Changuimun, the secondary fortress gate better known as Jahamun. The gate’s wooden top section dates to 1741, which makes it the oldest of Seoul Fortress’s remaining gates. Under the archway are colorful painted phoenixes – or maybe they’re roosters? Up ahead is another tunnel, which marks the entrance into Buam-dong. This quiet neighborhood feels far from downtown Seoul. Indeed, one shop owner described it as, “too quiet for a serious business.” Maybe so, but it’s a great place for lunch! Case in point is Cheers!, which specializes in some of the crispiest and juiciest fried chicken Seoul has to offer. It’s served alongside amazing fried potato wedges and a spicy-sweet dipping sauce and tastes great with a pint of draft beer. That sounds like the perfect way to celebrate our successful hike! 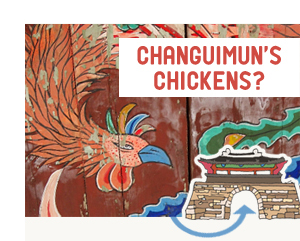 When you walk underneath Changuimun’s grand arch, you’ll see two winged beasts. While they’re not dragons, some think the official explanation is dubious. According to the signboards, the colorful animals are phoenixes, the mythical firebird from ancient cultures ranging from Egypt to China. But a folk tale suggests a more humble heritage. The birds are possibly chickens –roosters, to be exact. Given the Fortress’ long, centipede-like shape, its natural enemy would be the rooster. Achieving balance – the yin and yang – was of critical importance in ancient Korea, so Changuimun’s chickens were said to repress the centipede’s energy, thus creating harmony. So, what do you think they look like? If fried chicken doesn’t suit you, next-door is Rabia, which serves yummy Italian fare. Or, turn right at the intersection to find a couple of restaurants, cafés, a bakery specializing in cupcakes and a flower shop on the main drag. If a jolt of caffeine is what you need, across the street from Cheers! is Club Espresso, a large café that’s been dedicated to the fine art of coffee since 1990. Got even more time to burn? Check out the popular Whanki Museum. Before the post-lunch sleepiness sets in, let’s get back on the road. This time it’s a walk down a tree-lined street boasting great views of red tile roofs and the city. We’ll pass a bronze statue of Police Commissioner Choi Gyu-sik who was killed by North Korean spies in 1968. 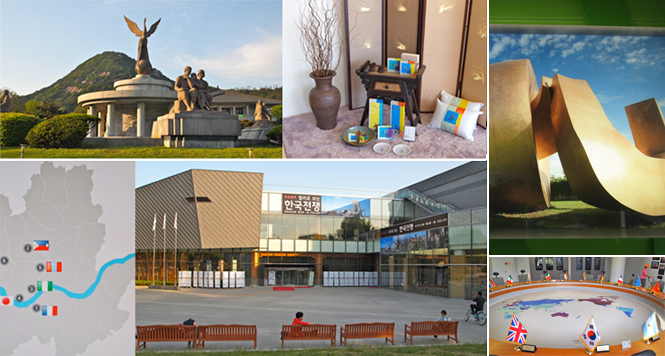 After about a kilometer, we’ll arrive at Cheongwadae Sarangchae, an exhibition and museum space showcases the history of the Korean presidency, government initiatives and aspects of Korean culture that are popular around the globe. The word “sarangchae” refers to a detached room in traditional Korean manors where men would entertain fellow male guests. Once we’ve had our fill of the exhibits, I suggest checking out the souvenir store that’s located next to the lobby. There’s a surprising mix of interesting and high-quality items about Seoul and Korea. It’s a great place to stock up on gifts for family and friends back home! Although Gyeongbokgung Palace was originally built in the late 14th century, it was burned to the ground during Japan’s Hideyoshi invasions after some 200 years. When King Gojong rebuilt the palace in 1868, he created a virtual city with over 300 buildings covering 64 hectares. In fact, ancient Seoul’s five palaces formed a royal compound that was second only to Beijing’s Forbidden City. 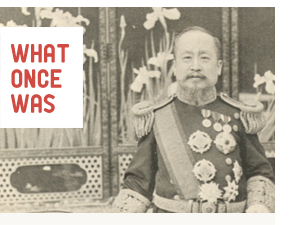 Sadly, when the Japanese government annexed Korea in 1910, it razed 90% of the royal buildings and gardens. Today, both the president’s official residence, Cheongwadae, and the Cheongwadae Sarangchae are located on former palace grounds. 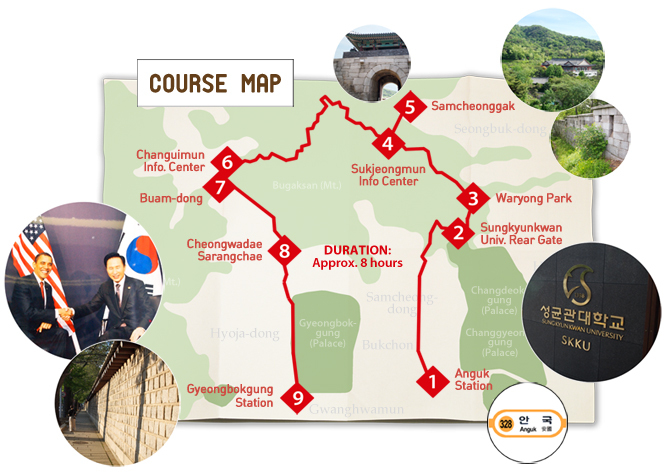 Once we’ve finished our tour of the Cheongwadae Sarangchae, our tour is almost complete! But before we say goodbye, let’s take a final stroll along another famous city wall. It’s not part of the fortress wall, but it’s the stately western wall of Gyeongbokgung Palace. Gyeongbokgung was the primary royal residence of Seoul during the late Joseon Dynasty. At the end of the wall is a busy intersection. Turn right and you’ll quickly reach exit 4 of Seoul Metro Line 3’s Gyeongbokgung Station. …which is where our tour of Seoul’s fortress and palace walls comes to an end! I hope you enjoyed seeing the city with me. Thanks for coming along and let’s do it again soon!